I was always told to check for bees in my soda can. F*cking paranoid because of my mom. 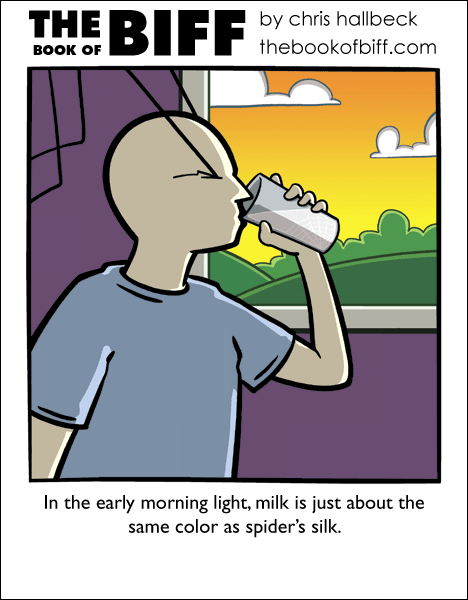 If it’s goat’s milk, it could BE spider’s silk. I finally reached the end of the archives…. …I guess that means less reading Biff for me…. Needless to say, if I leave my drink unattended outside for even a few seconds, I check the straw before drinking. that thing about spiders is a myth. it was first mentioned in a research paper as an example of “little known facts “that everyone believes without question. it was then spread to many fact books and internet sites. can you say irony? Arthropod (or arthropodan material) digestion is one of the grossest subjects I’ve encountered so far. YukiSNowFlake, yeah I finished reading the archives a while ago, I’m kinda sad that I’m going to have to wait everyday for one new comic. When I was a kid, drinking a fruit nectar, a bee flew in and I drank him. @Sven That’s just an urban legend. I used to keep glasses right side up in the cupboard. I stopped after I swallowed a spider that had been living in one of them! That’s nothing, I spotted ants in the kitchen. It was a baby-sized one. Probably got lost on the way back to the colony. My parents are planning to lay down traps when they can. Still, I guess that is unsettling.